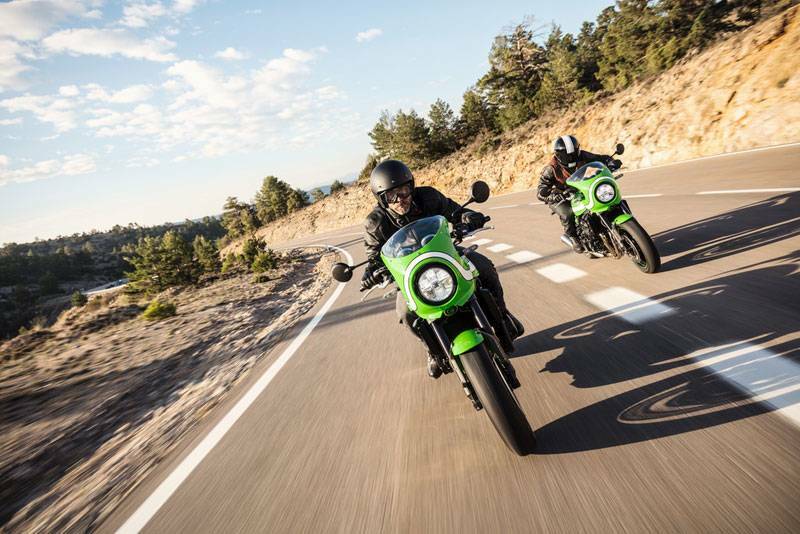 Thanks to its smooth In-Line Four tuned for strong low-mid range torque, and unhurried handling care of its lightweight trellis frame, the ride feel of the Z900RS Cafe is unique in the retro category. 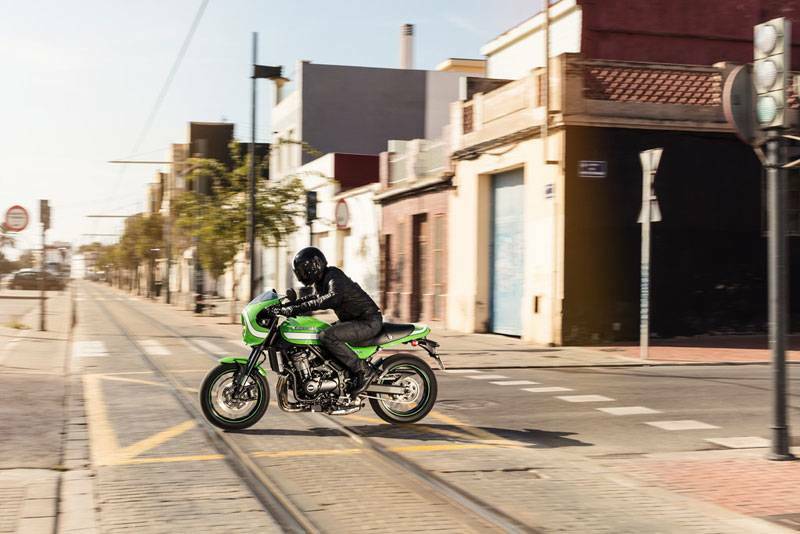 Both engine and chassis response were carefully designed to not be too quick, making it easier to feel at one with the bike. The resultant stress-free riding is complemented by a crafted exhaust note that enriches the riding experience from the time the rider thumbs the ignition – features that will enable riders to enjoy their machine for many long years. 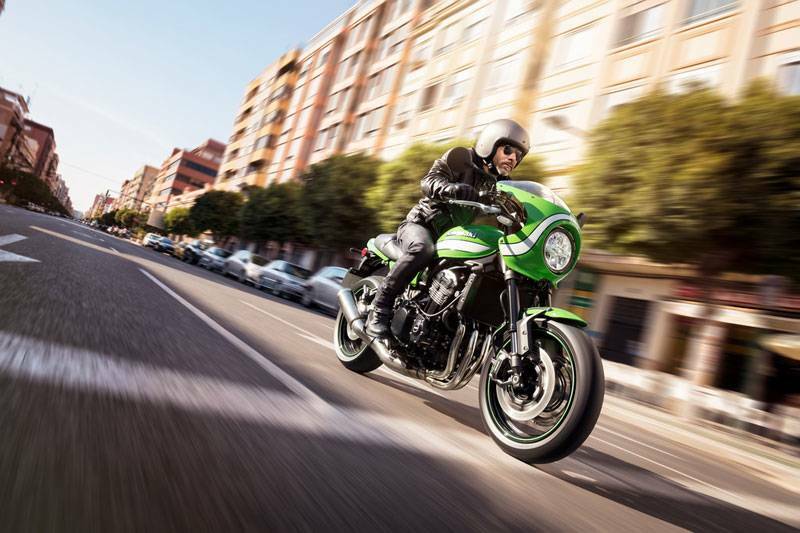 The Z900RS Cafe's racer styling is reminiscent of the legendary Kawasaki bikes of yesteryear: it is happy to run at a leisurely pace, but is more than capable of accommodating more spirited riding should the mood arise. 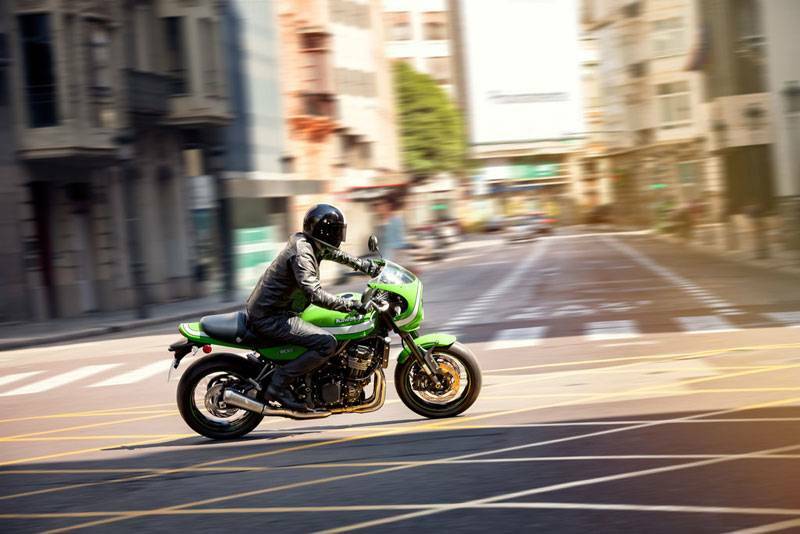 Like the Z1, the Z900RS Cafe features a 900cc-class In-Line Four – an engine configuration that inherently offers a great balance of power and manageability. 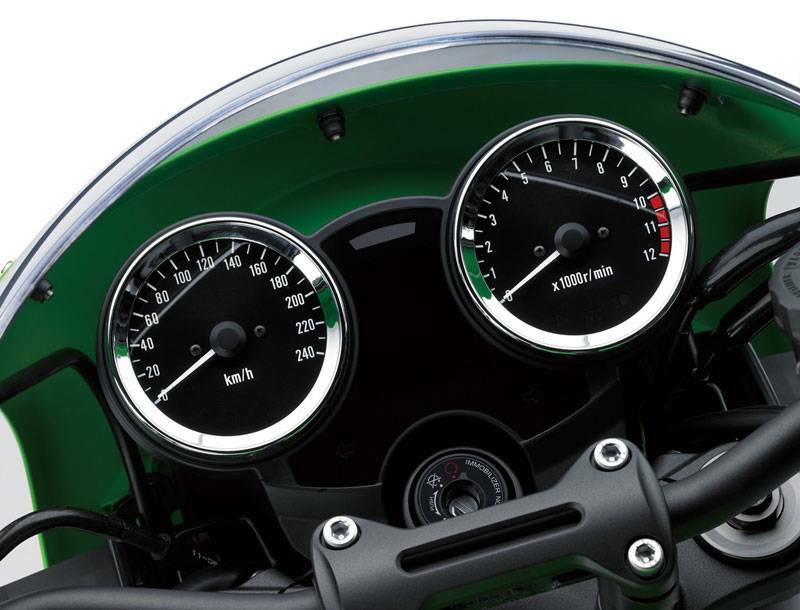 Tuning focuses on the low-mid range. 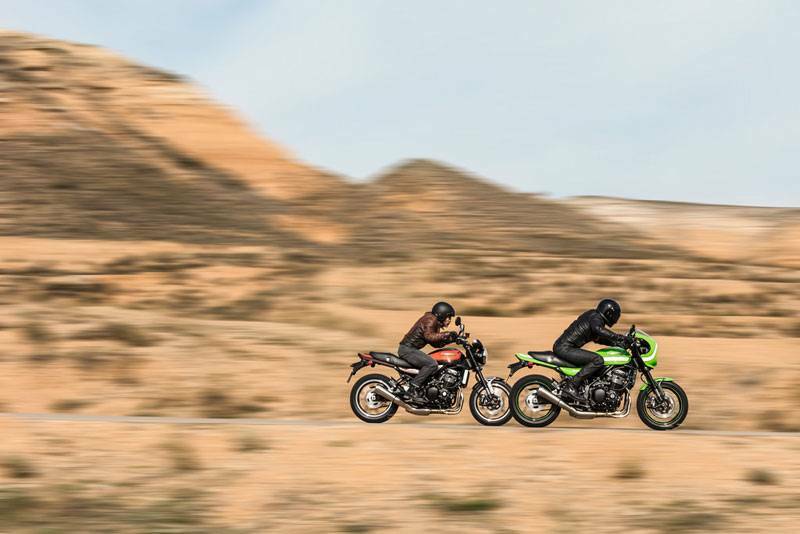 Revs build in a measured, but very determined manner, giving the rider a sense of connectedness between the throttle and rear wheel. 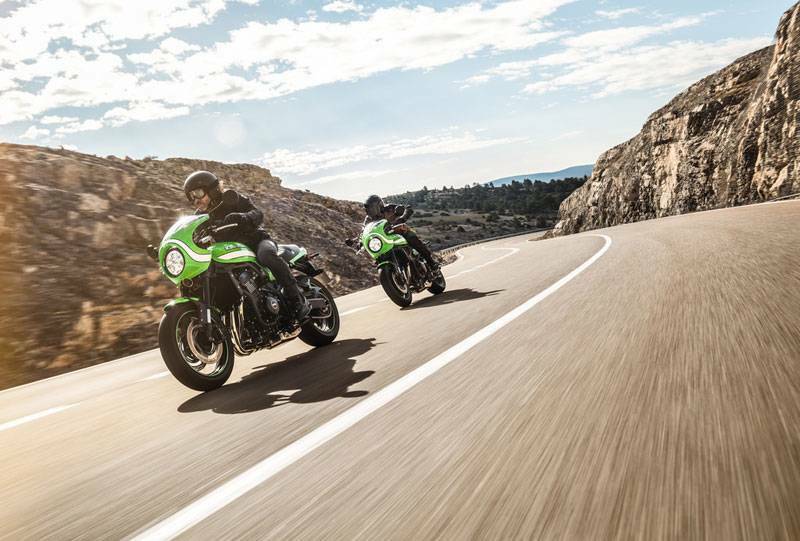 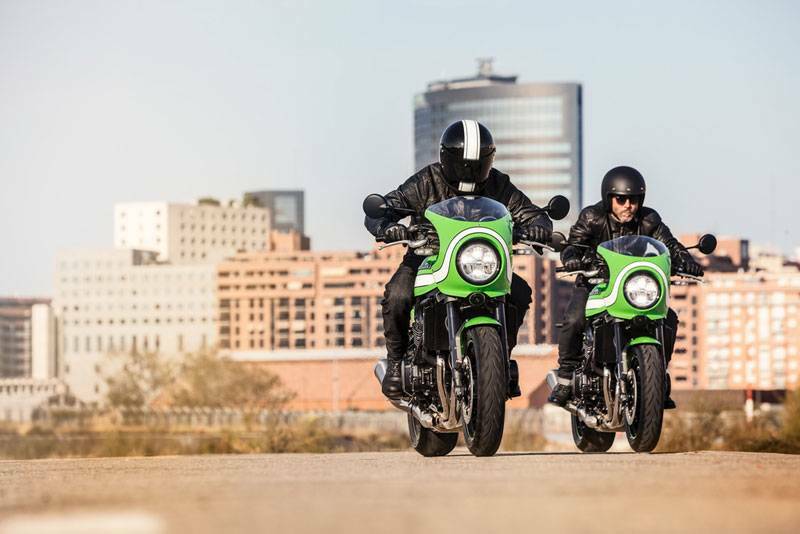 Contributing to rider reassurance, the Z900RS Cafe is equipped with advanced Kawasaki rider support technology. 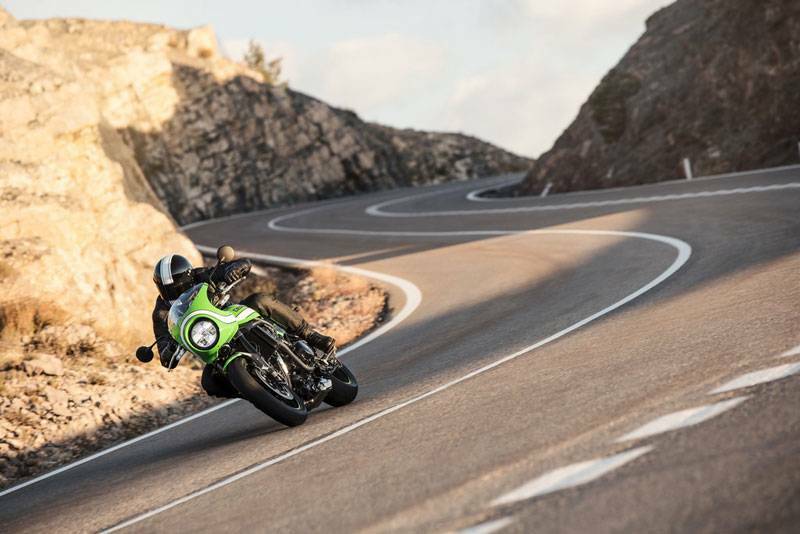 KTRC features two modes that cover a wide range of riding conditions, offering either enhanced sport riding performance or the peace of mind to negotiate slippery surfaces with confidence. Riders can choose from two modes. 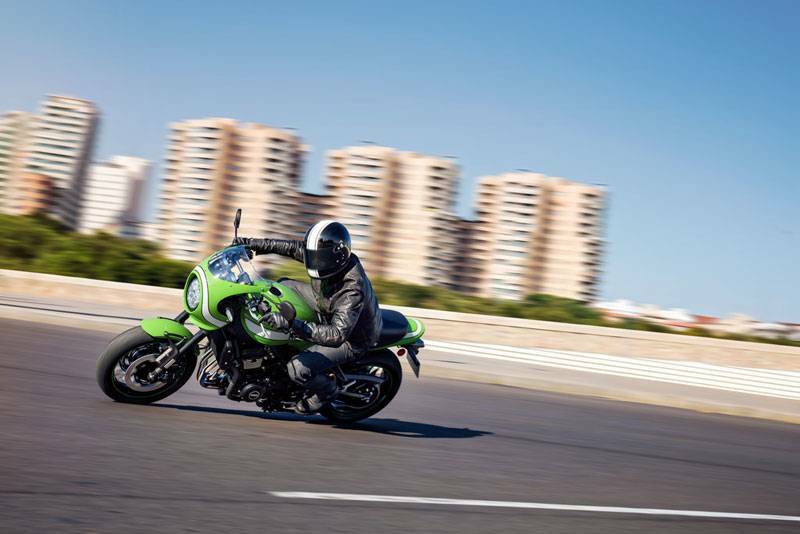 Mode 1 prioritises maximum forward acceleration. 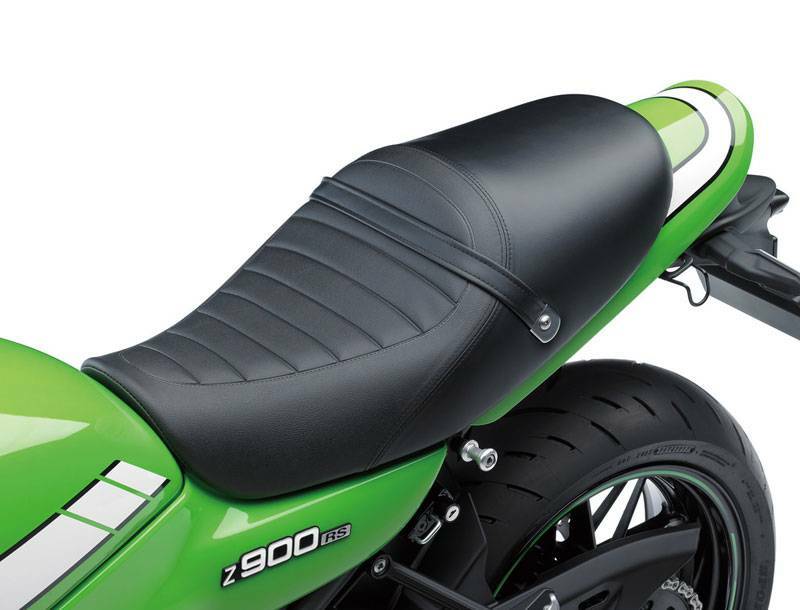 Mode 2 provides rider reassurance by facilitating smooth riding on slippery surfaces. 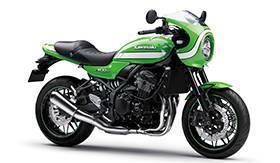 Riders may also elect to turn the system off. 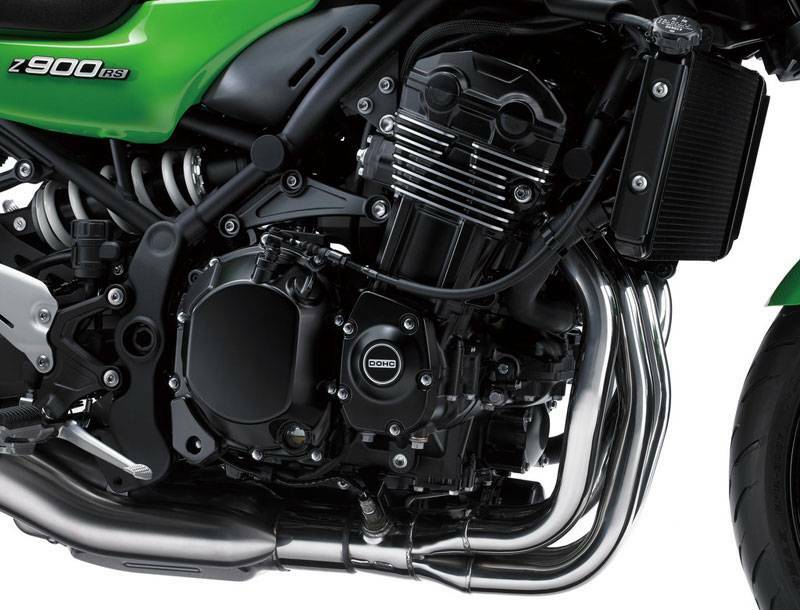 When designing the exhaust system over 20 variations were considered before arriving at the final design, one that emphasises the presence of the In-Line Four engine. 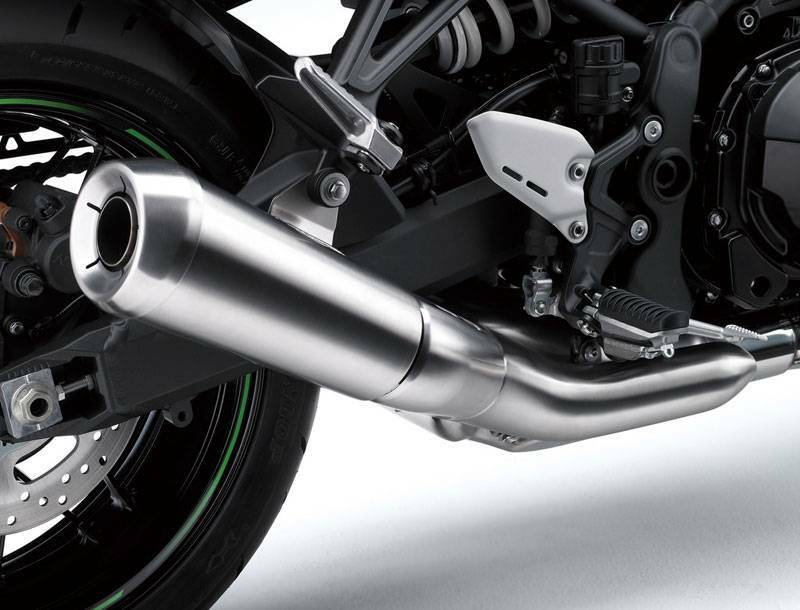 Double-walled header pipes give the exhaust a more powerful appearance, while making it more difficult for the headers to become discoloured over time. 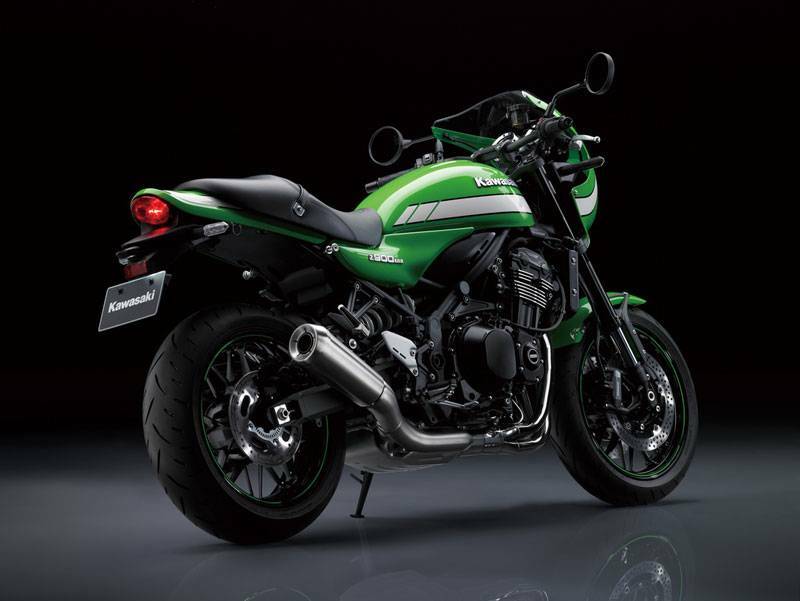 The Z900RS Cafe features brushed finish to the short megaphone silencer which contributes to the Z900RS Cafe retro sport image. 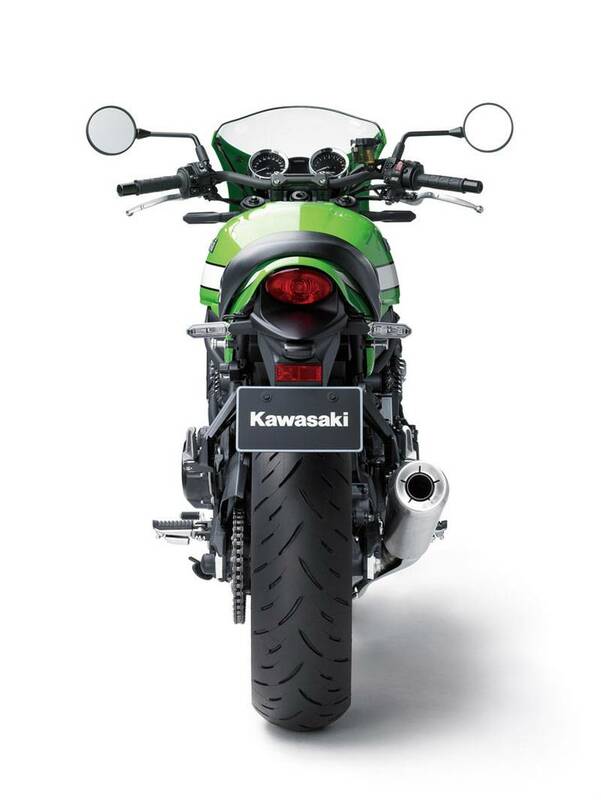 Unlike the twin rear shocks of the Z1, the Z900RS Cafe features Kawasaki’s Horizontal Back-Link rear suspension.This choice of modern suspension (also featured on Kawasaki’s supersport and super-rnaked models) offers a higher level of sporty riding potential – something that Kawasaki engineers were not willing to sacrifice. 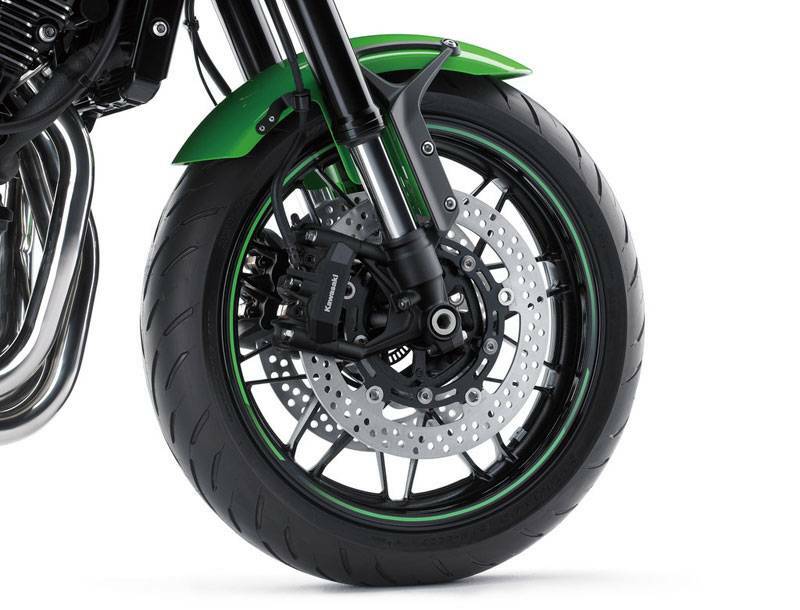 Like the fork, the linked rear suspension delivers a balance of ride comfort and sporty performance.The rear shock features stepless rebound damping and stepless preload adjustability. 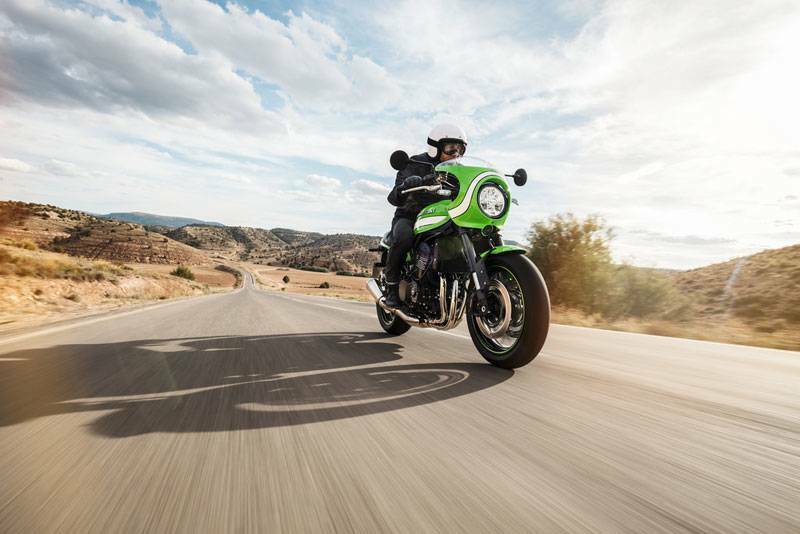 Complementing a light overall weight (noticeable as soon as the bike is lifted off its side-stand), frame rigidity and chassis geometry tuning were selected to deliver light, natural handling. 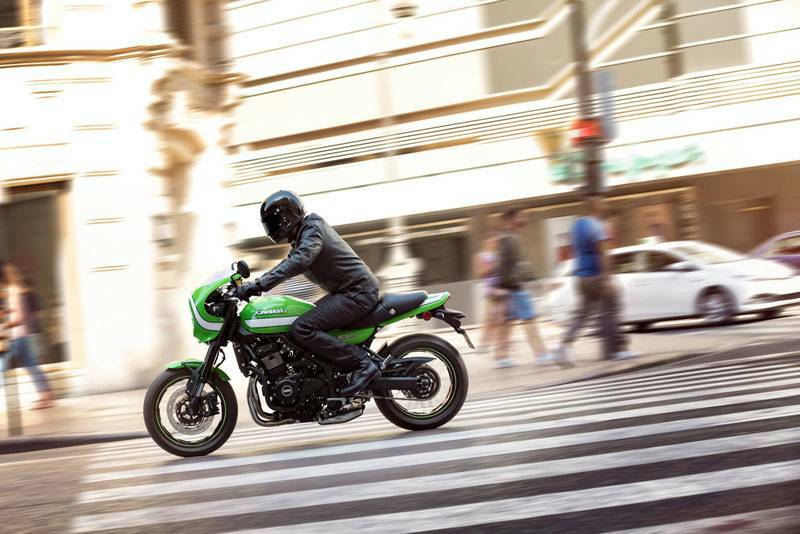 Like the engine, the chassis responds to rider input predictably, going where the rider wants it to without resistance. 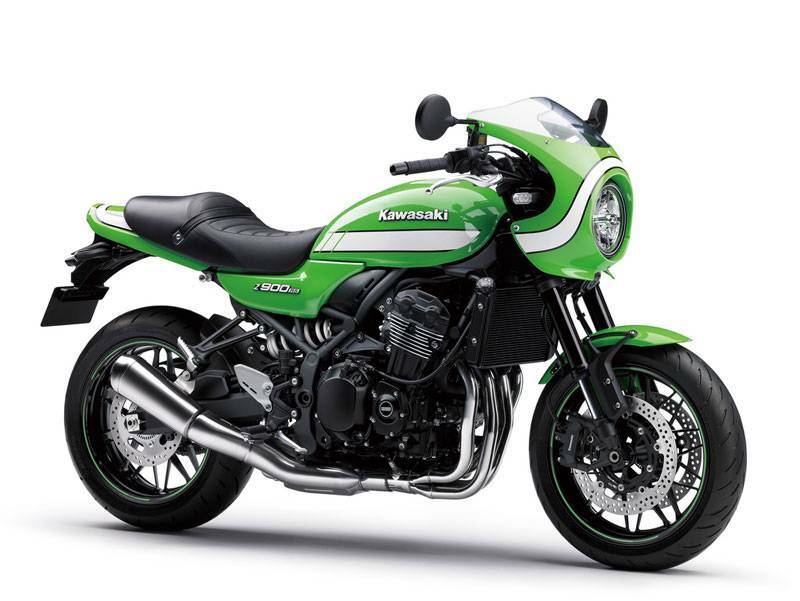 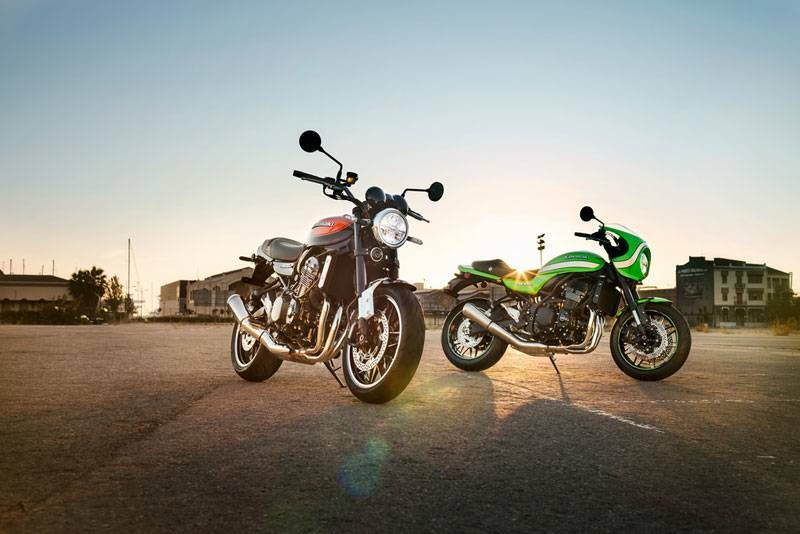 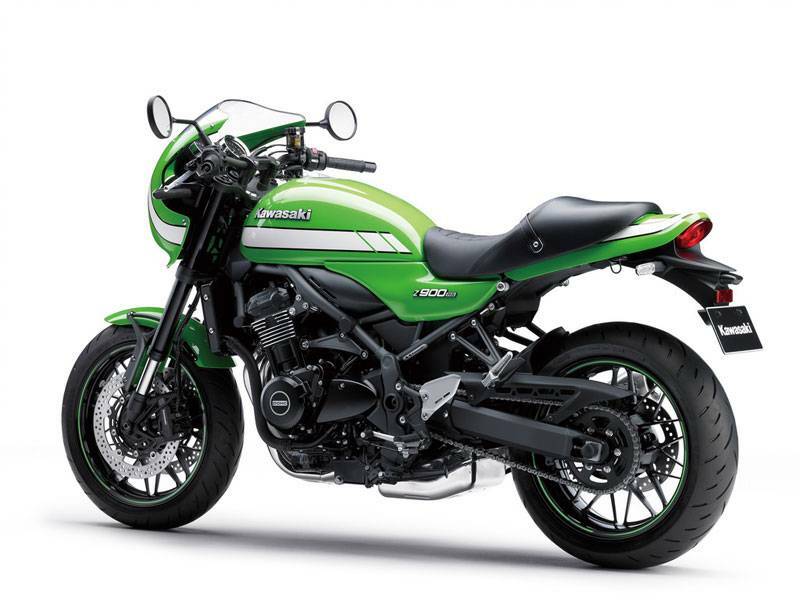 In keeping with its retro sport model character, the Z900RS Cafe stance is slight more forward-leaning than the Z900RS, and it features a black drop-style handlebars design. 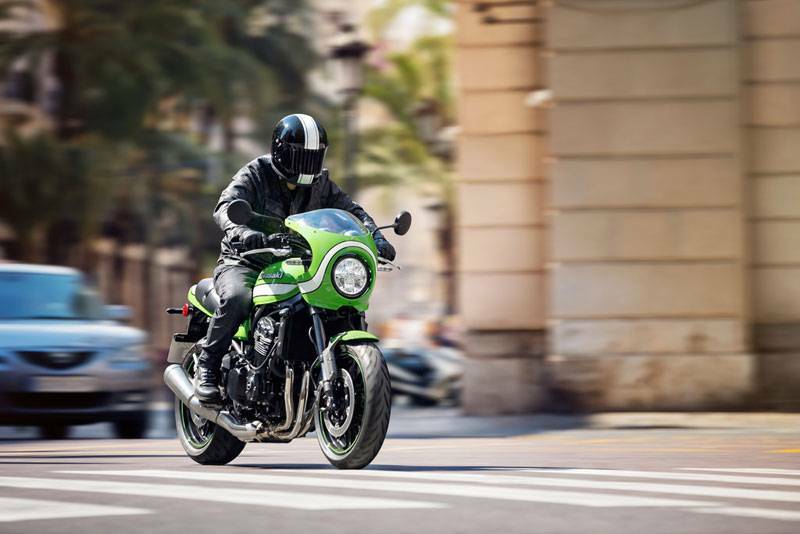 A product of Kawasaki’s advanced analysis technology, the frame had to be completely redesigned to accommodate the slim teardrop fuel tank and offer a handling character optimal for enjoyable riding at a more measured pace. 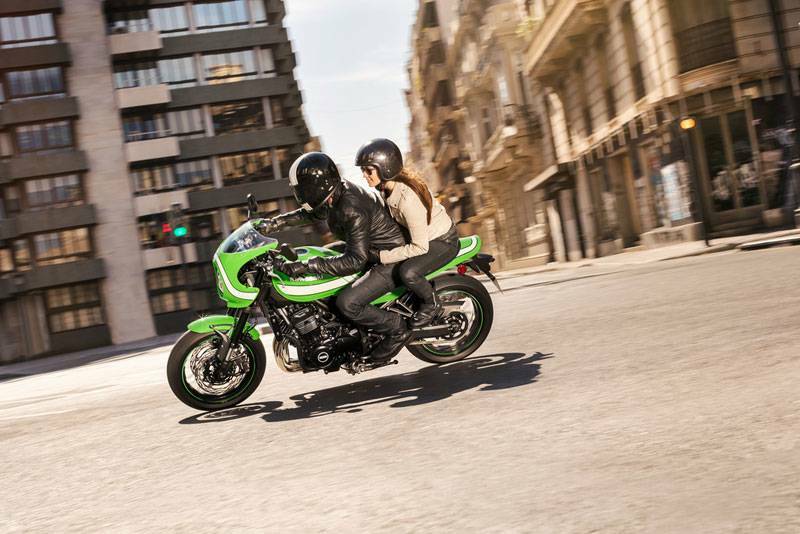 handle position and a more upright riding position than the Z900. 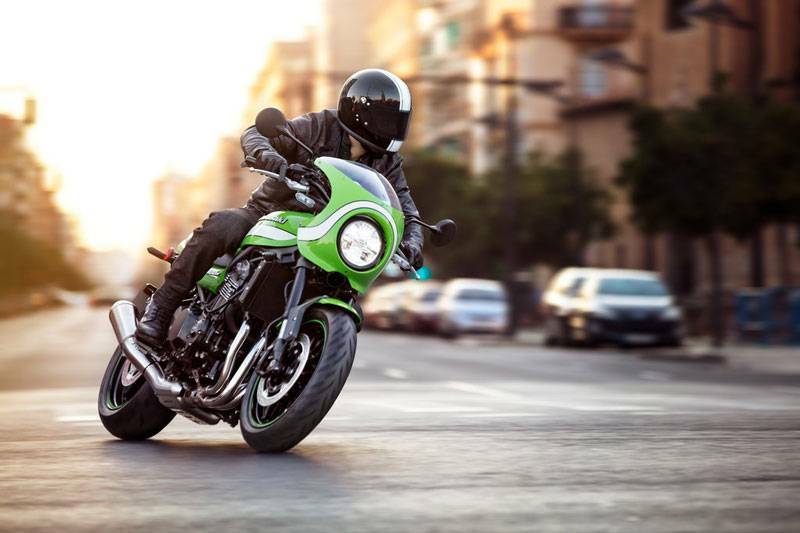 With a seamless blend of Z1-inspired styling elements and modern craftsmanship –from the iconic teardrop fuel tank to the innovative oval LED taillight –the Z900RS Cafe offers timeless good looks with an exquisite attention to detail and superb fit-and-finish that results in a very high-quality appearance. 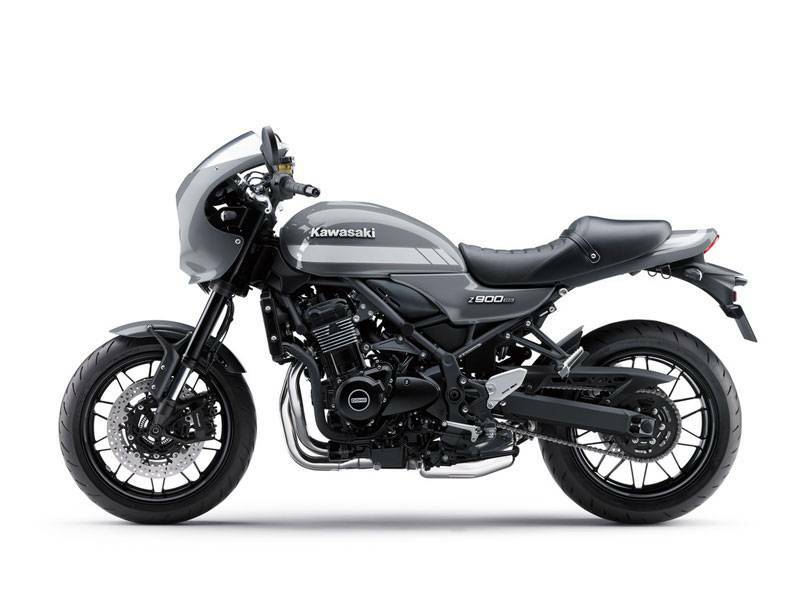 Functional beauty was a priority, with a simple, yet refined design pursued. 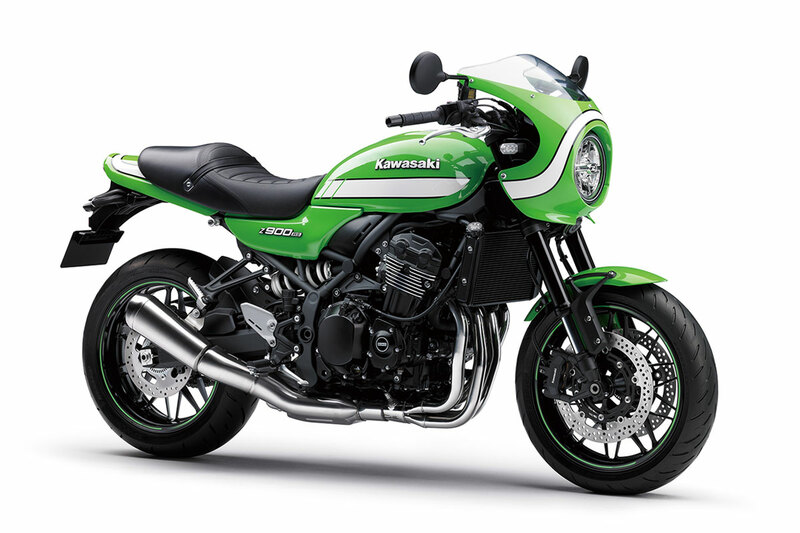 In contrast to the sharp, edgy design of the Z Supernaked models, the Z900RS Cafe uses rounded elements to emulate the retro-style design of classic motorcycles. 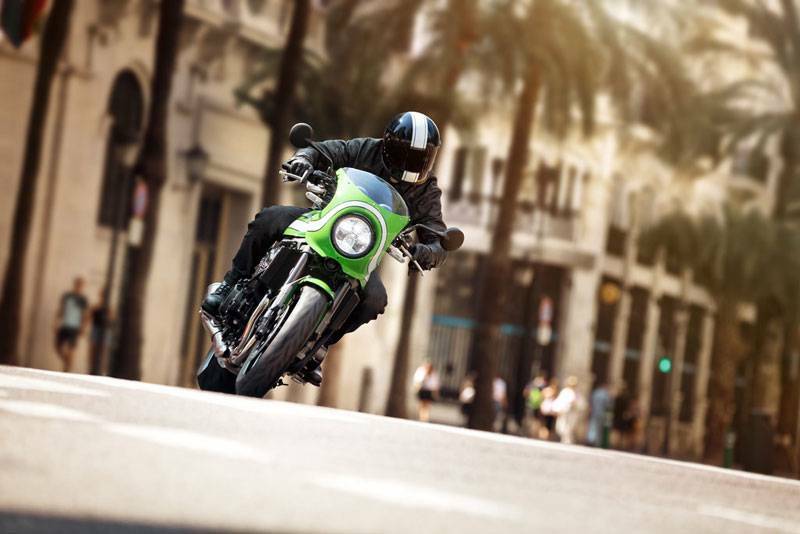 A blend of retro and modern designs, the large ø 170 mm LED headlamp casts a bright, white light for great night-time visibility. 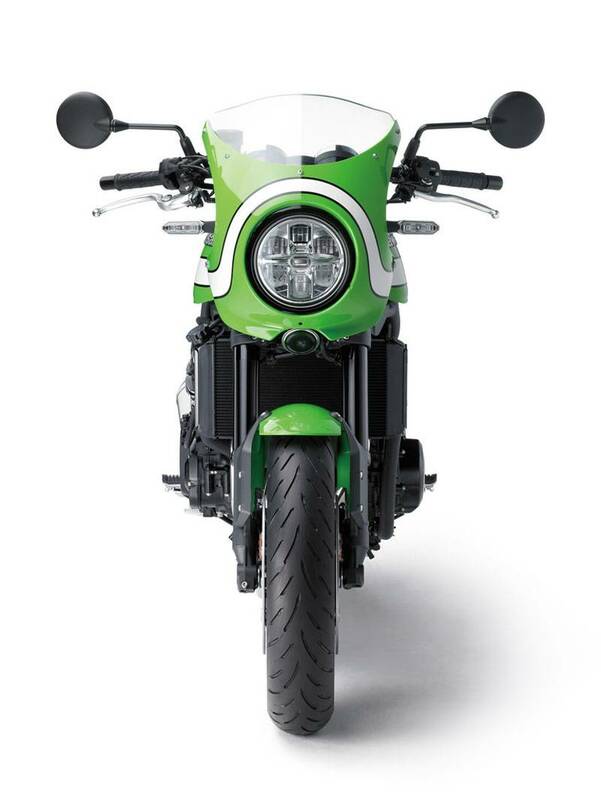 It features six chambers (four for low-beam, two for high-beam). 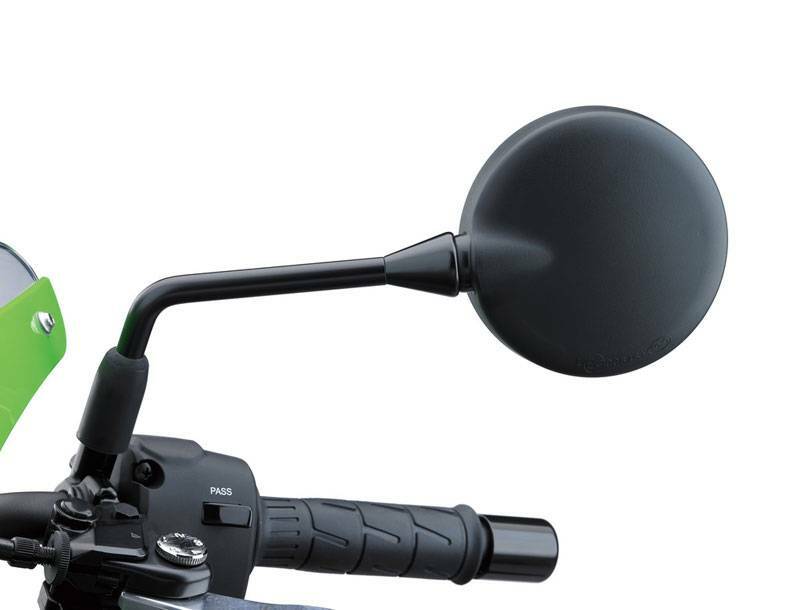 Position lamps in the high-beam chambers ensure the whole lamp appears lit, like a retro-style bulb headlamp. 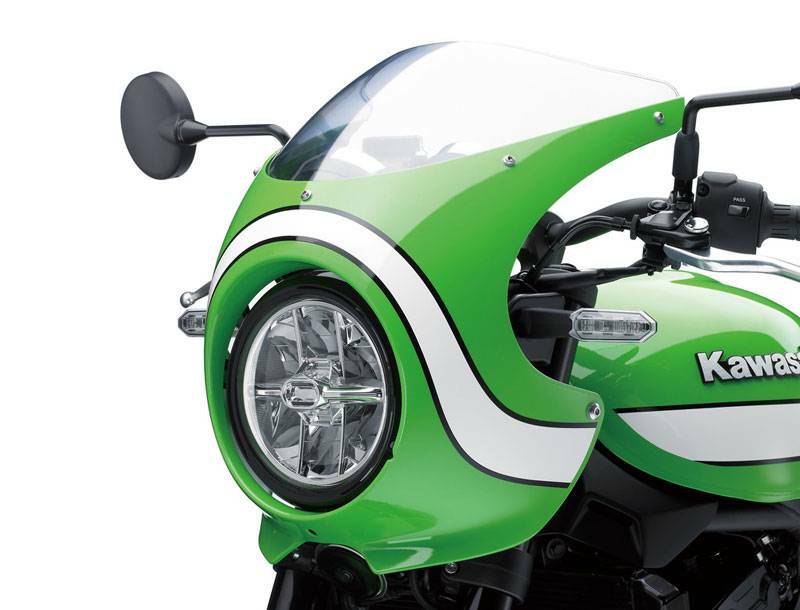 Details like a convex lens and chromed headlamp ring add to the high-quality, retro sport design. 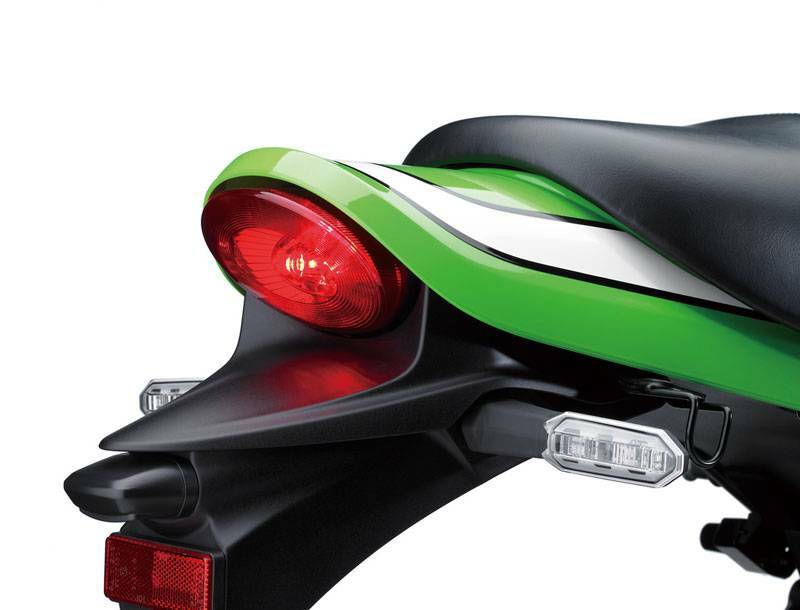 LED turn signals contribute a modern touch. 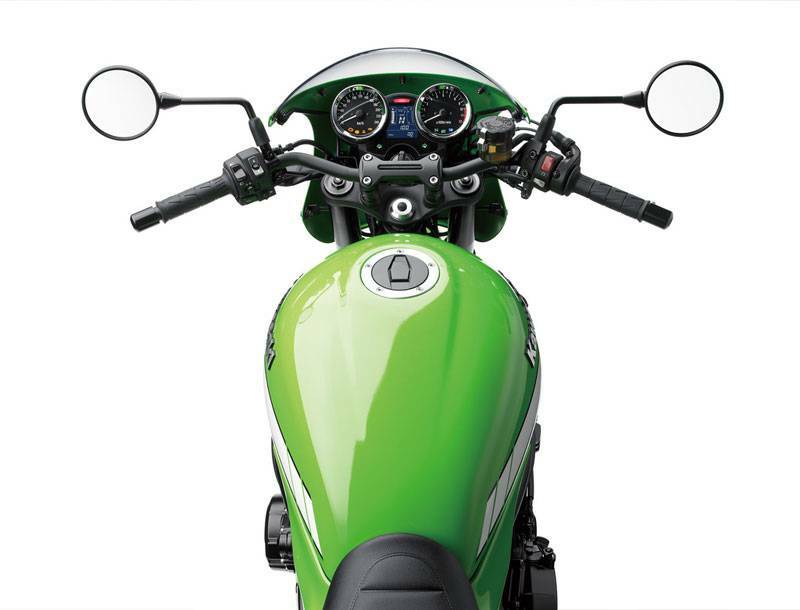 Wide, flat handlebar contributes to the retro sport styling while offering a wide grip to facilitate control. 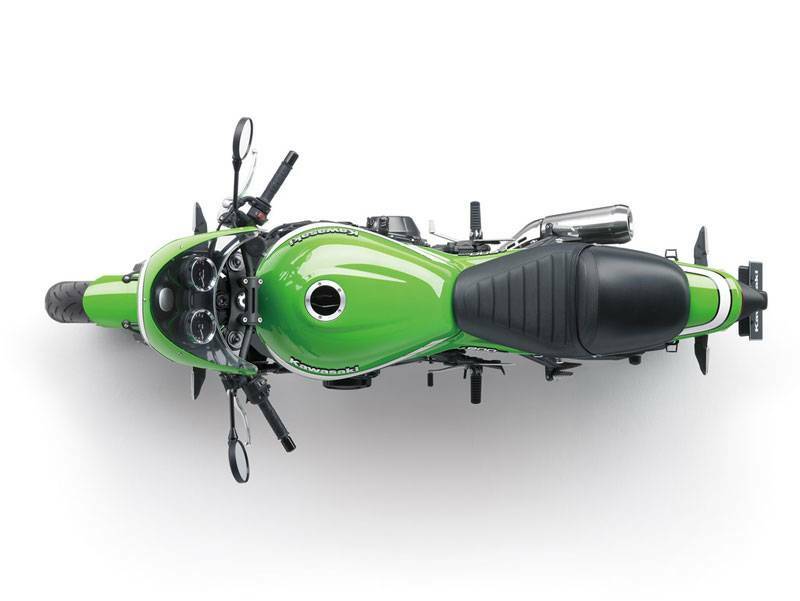 A wide 35° steering angle facilitates low-speed maneuvering. 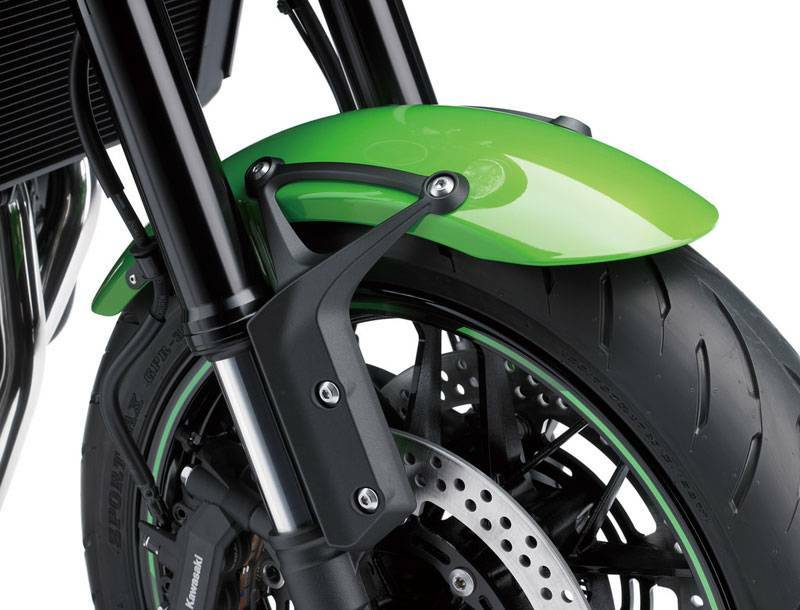 The black finished drop-style handlebars add to the high-quality image. 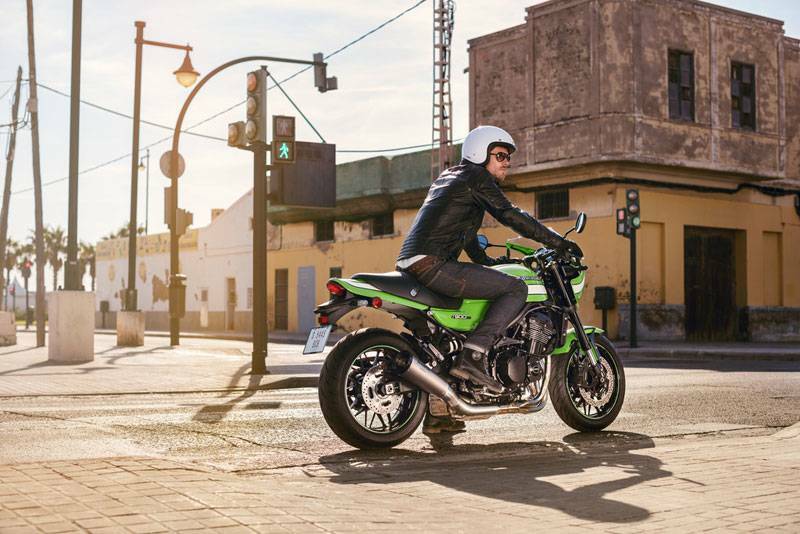 Thanks to the low seat height and the bike’s slim overall design, it’s easy to keep both feet firmly on the ground when stopped, an important consideration for many riders. 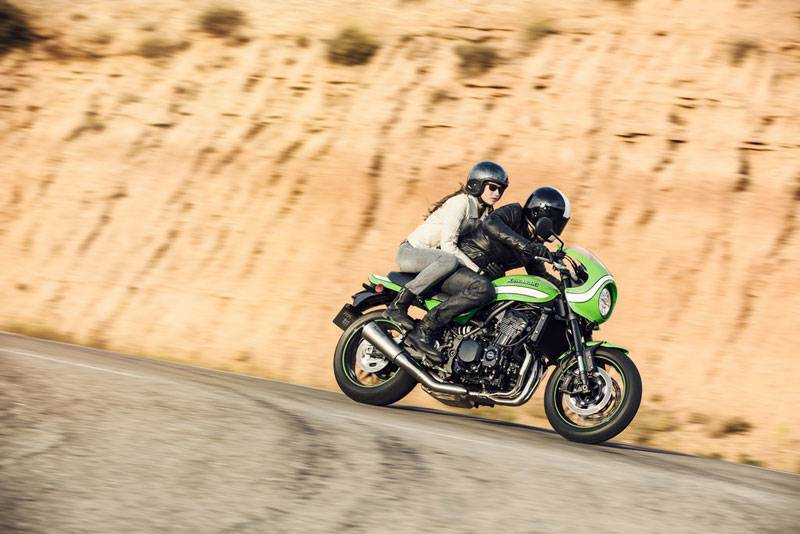 820 mm seat height enables a wide range of riders to enjoy the Z900RS Cafe with confidence.The seat is slimmer at the front, facilitating the rider’s reach to the ground. 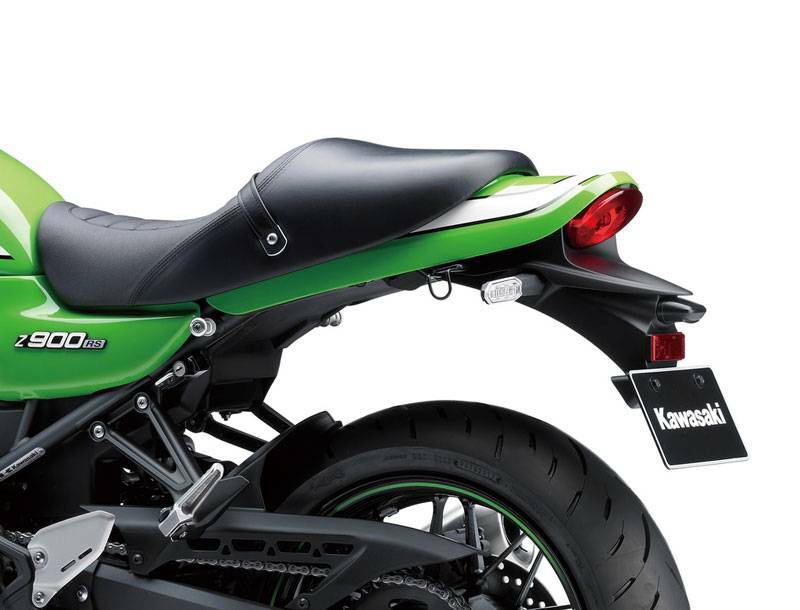 The seat can be removed without tools, offering easy access to the battery, fuse box and tool kit. 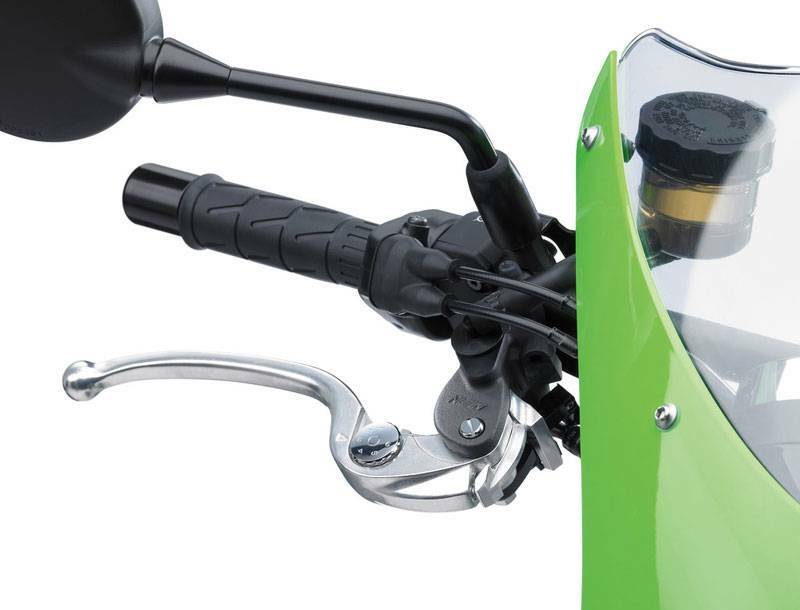 Radial-pump front brake master cylinder also contributes to the superb control and feel offered by the caliper. 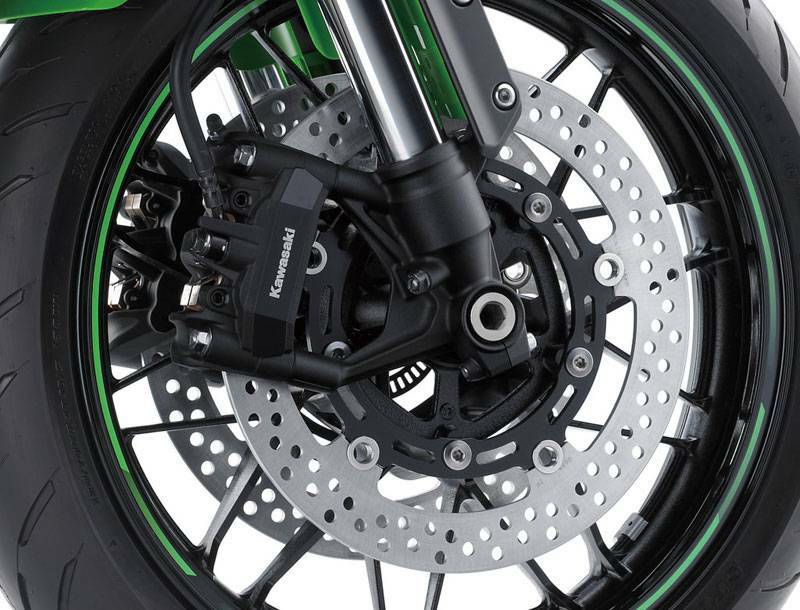 At the front, 300 mm brake discs are gripped by opposed 4- piston radial-mount monobloc calipers. 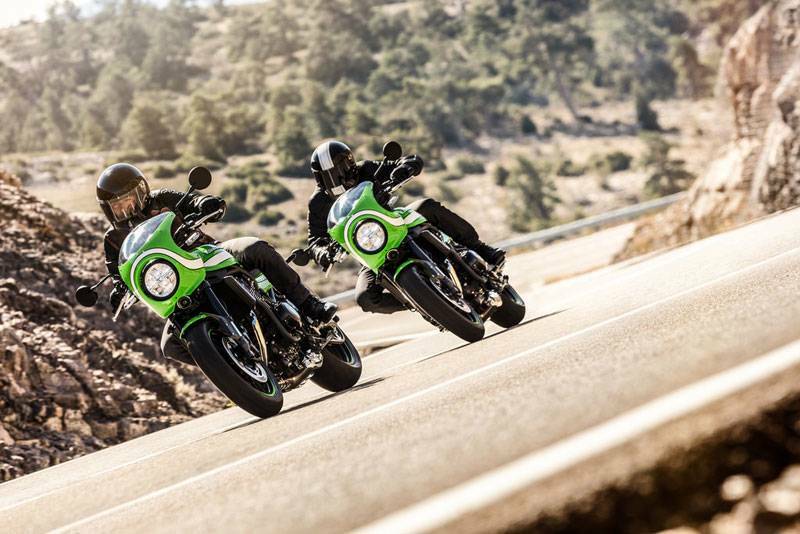 The monobloc front brake calipers offer a firm initial touch, the level of brake force is very easy to control, and overall brake performance is superb. 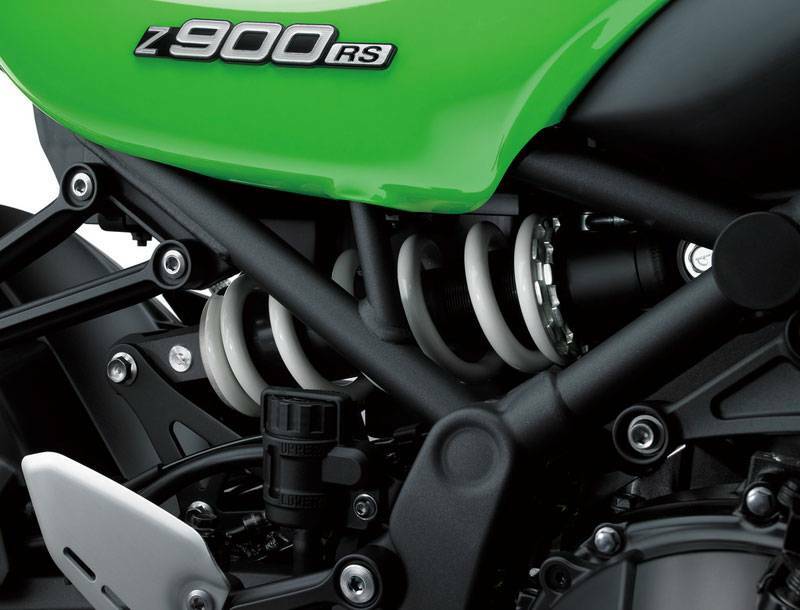 The Z900RS features ABS brakes standard. 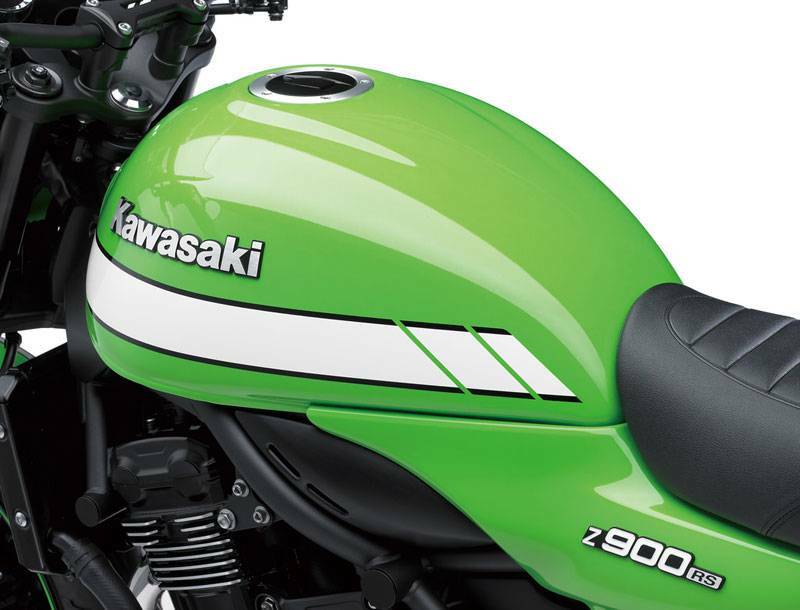 From the Cafe racer-style-image front cowl to the high-grade coating selected for the bolts, attention to the smallest detail, carefully considered wire routing, and a clean fit-and-finish contribute to the Z900RS Cafe’ high-quality appearance. The engine head cover is all black and the engine crankcase covers feature the DOHC logo used on the original Z1 for added style. 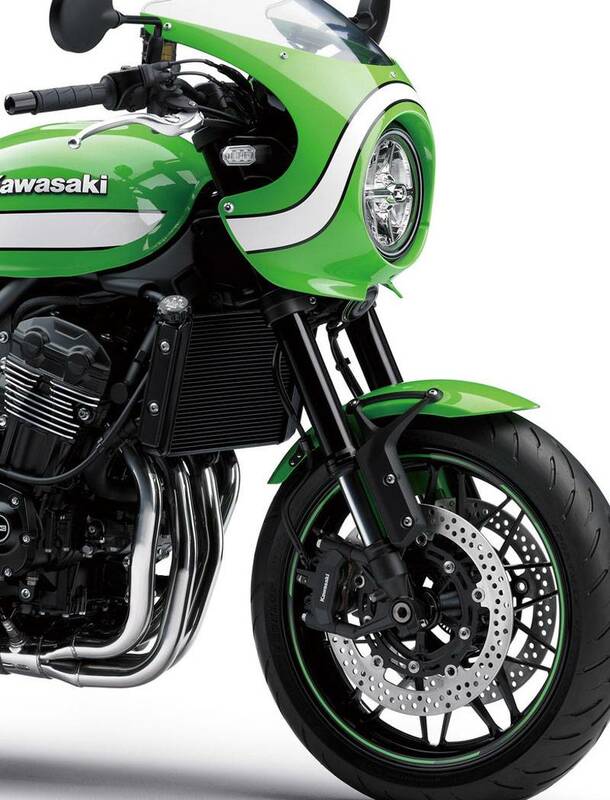 The Vintage Lime green version it features original colour and graphic design and the wheels feature green rim stripes and blacked out paint. 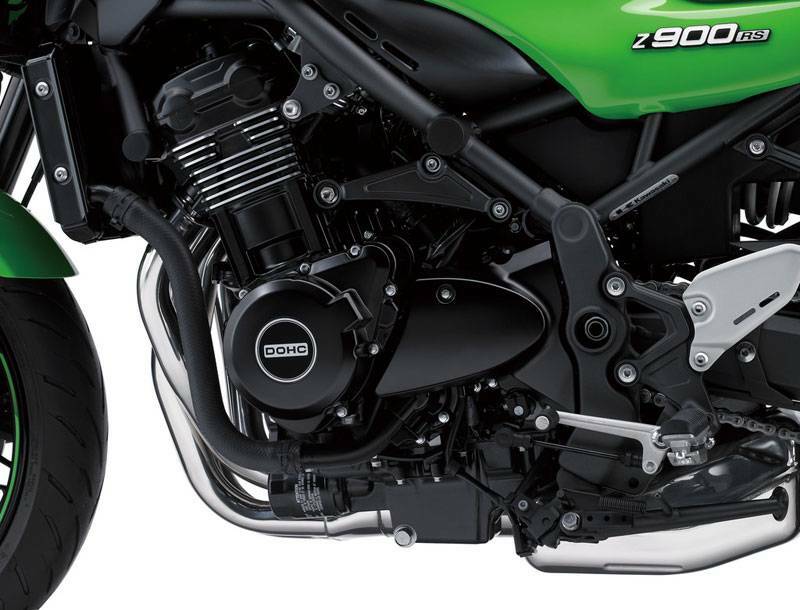 Gearing is optimised for the Z900RS Cafe' engine character. 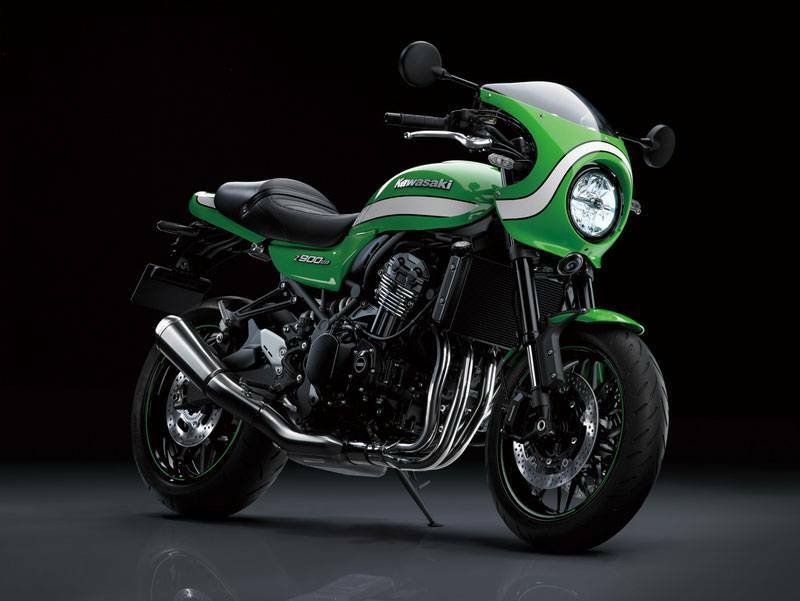 Relative to the Z900, a shorter 1st facilitates moving from a stop. 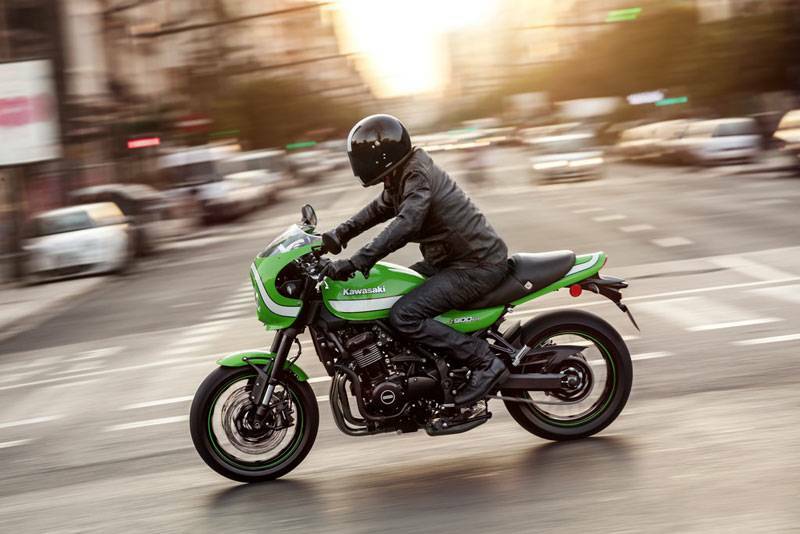 The engine's strong low end torque makes R900RS difficult to stall when first starting to move. 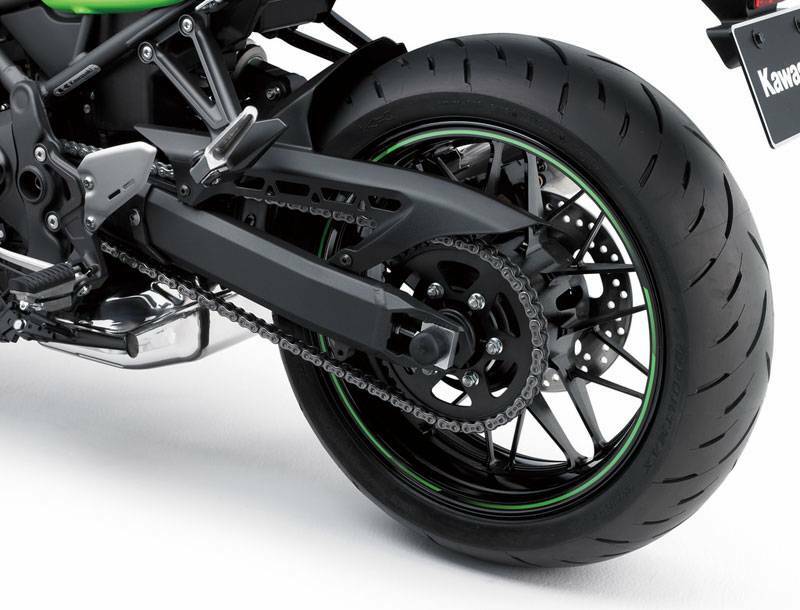 A longer 6th gear ratio contributes to ride comfort when touring or cruising at highway speeds. 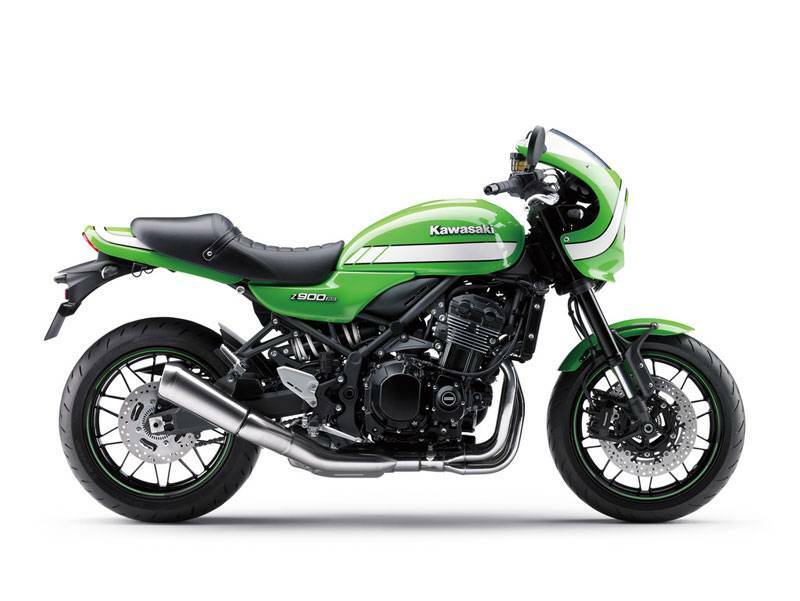 Enabling the engine to run lower rpm results in lower vibration and better fuel economy. 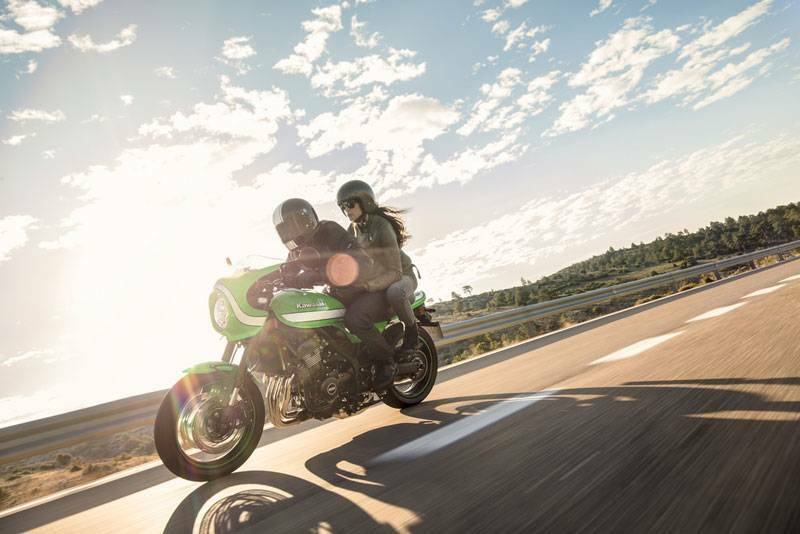 A longer final drive ratio ensures smooth departure from stop while contributing to ride comfort when touring (much like the longer 6th gear benefits).